There are a lot of different options and cheerleading fundraising ideas that you can choose. But if you are looking for high profits, easy to do fundraising that you should consider our cheerleading scratch card fundraiser. 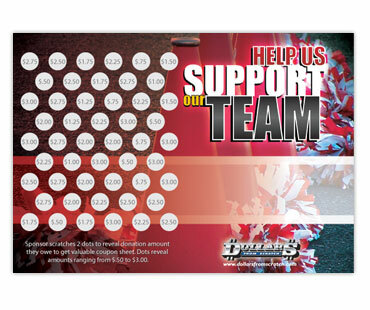 We have designed our cheerleading Fundraising Scratch Cards as a great way for your group to raise money. You get people to scratch off two of 50 concealed dots, request that amount as a donation and then give that donor a sheet of national coupons as a thank you gift. Your cheerleading group will make a minimum of 70% profit once all 50 dots are scratched off. It really is one of the highest profit cheerleading fundraisers available.